Denny has brought his unique expression of creativity to people from all walks of life. His message is simple: "It's not what you do, but the way you do it that's important. Whatever you do... do it with all your heart. Be what you are... be creative!" To say the least Denny Dent was the father of his art form. 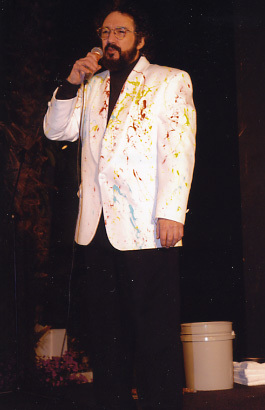 Denny has been described as the world's only "rock and roll painter". The painting was secondary to Denny. The message was most important. His message was to stir creativity in people. His repertoire featured Denny's renderings of John Lennon, Jimi Hendrix, Elton John, Mick Jagger, Billy Joel, Frank Sinatra, and Tina Turner, to name a few. With three brushes in each hand, Denny paints portraits on six foot canvasses in the time it takes to play a few carefully selected pieces of music. Whether painting Jimi Hendrix, General Colin Powell, Jack Niklaus or Martin Luther King, Jr. The artist himself refers to his work as "a passionate dance on canvas," and those who have seen his creations are compelled to agree. Denny Dent was born and raised in Oakland on April 5, 1948, and has spent the last ten years living in the Denver area. Since his beginning, Denny had performed to thousands of people around the world and brought to life portraits of sports icons, entertainers, captains of industry, and political figures. From painting two Presidents to performing at the Rock & Roll Hall of Fame to the stage of the Woodstock '94 concert, Denny's Fame continued to grow. He also performed at many sporting events, including honoring Patrick Roy on his 300th NHL career game. Denny painted Denver Bronco star John Elway and golf legends Jack Niklaus and Tom Lehman. The diversity of his performances have included painting Beethoven with the accompaniment Colorado Symphony Orchestra, painting Pope John Paul II at the World Youth Day in Denver, and a painting of Martin Luther King, Jr. that was presented to the family of the civil rights leader to be hung in the King Library. 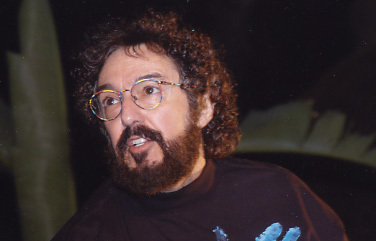 At 55 years of age, he passed away on March 29, 2004 from kidney and heart complications. A celebration of his life and message are being planned for the future... As soon as the time and place are determined , we will post the information regarding the benefit here on the web site. He will truly be missed, and his spirit lives on through you.... Thank you.